Every year, nearly 15 million babies are born prematurely, and in California, those premature birth rates continue to climb. These babies and their families face so many obstacles right out of the gate, but hospitals like Bakersfield Memorial are trying to make their lives a little easier, with a little bit of T-L-C.
BAKERSFIELD, Calif. — Every year, nearly 15 million babies are born prematurely, and in California, those premature birth rates continue to climb. According to a Premature Birth Report Card released by March of Dimes preterm birth are rising in the state, following a trend nationwide. For babies born as preemies or those that need special medical attention, they are placed in the Neonatal Intensive Care Unit or NICU. There, they undergo their treatments until they are able to be released to their families. These infants require special attention and need the extra love and care which their parents may not be able to provide due to work obligations, living far from the facility or even having to care for other children at home. 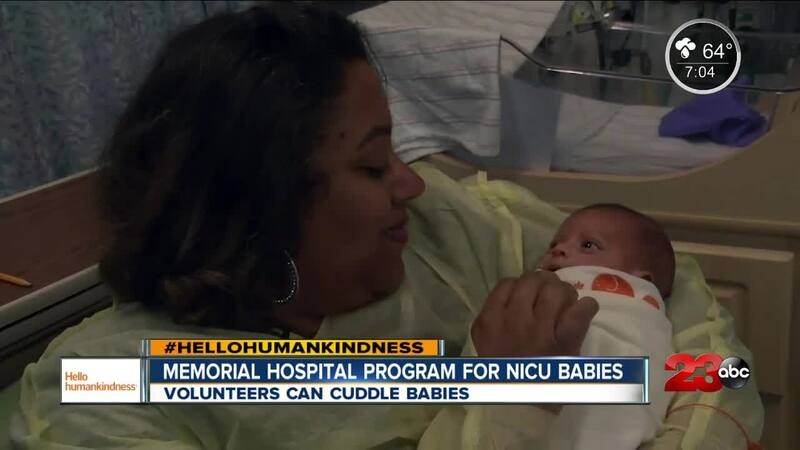 Often it is the nurses who will spend their time cuddling and giving attention to the babies, but a program at Memorial Hospital acts as a support system for the nursing staff. Studies have shown that the benefits of holding babies early on has long term health benefits. Touch is one of the first senses that the infants develop and so by holding these babies early on, they are able to form emotional connections and develop mentally. For volunteer, Diana Andrade, the program is a rewarding one, and one that allows her to give back to the community. Andrade has been a cuddler for a little over a year now, and she says the entire process is extremely warm and welcoming. From working with the nurses to the interactions with the infants themselves. At Memorial Hospital, volunteers come in on a scheduled basis and spend about 2 hours cuddling the infants. The volunteers have to go through a rigorous process to actual cuddle the babies, including a physical, vaccinations and background checks in addition to a formal interview. All of this is to ensure that your baby is in the right hands. Volunteers like Andrade say that it’s not only beneficial for the babies, but is a relaxing and rewarding moment in their day. As of right now, the program has nearly 30 volunteers and while Hunt says you may be put on a waiting list, they always encourage people to sign up. If you would like to volunteer, click here and select "birthing center" when selecting interests!